When you want to remember the moment, you should try to make it into a video clip. GrooveVideo can be a easiest solution for you to create your own video. Video clips you have recorded with your smart phone, camcorder, or action cam are not easy to share with your family members or friends. Editing video clips are not easy for everyone. You need to review hundreds of video files to get right clips and it requires some studies before you master conventional video editing softwares. Video editing work is very time comsuming and complicated for most of people. Forget about video editing, music syncing, and all that complicated video effects! GrooveVideo will let you focus the moment you wish to remember. Just select select video and photos from your device. GrooveVideo analyzes and gathers highlights of video. 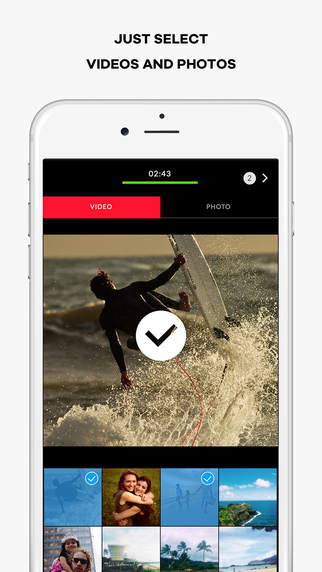 In no time, GrooveVideo will create a minute length of video for you automatically. Music completes video! Properly selected and arranged background music totally changes ambience of video. GrooveVideo analyzes beats, tempo, and BPM of background music. Based on number and duration of videos and photos you selected, GrooveVideo will select a proper music and calculate number of beats and length of its beat to match the video properly. This auto sync process will let you have a hight quality video tha flows with music. GrooveVideo offers GrooveClips that are high quality musics for free. If you wish to use a music out of your music library, you can select one from your device as well. Once you use a music of your own, you can set a start point of your music manually. GrooveVideo is called the video editor with music, and that is definitely this app’s description in a nutshell. 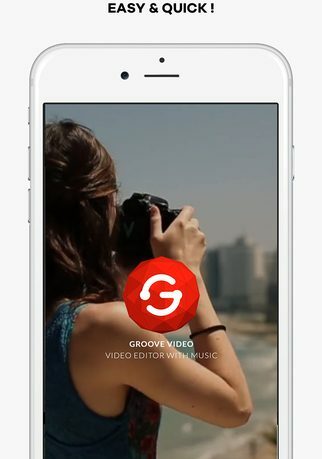 GrooveVideo app takes your memorable videos and snapshots and mashes them up into a musically lead collection. First off, select up to 12 various images and videos from your phone that you would like to groove. Videos must be more than six seconds, but less than three minutes. It doesn’t matter what order you choose because GrooveVideo is going to pick the highlights of each media and arrange it to fit the appropriate music. Based on the media chosen, the app will sync it with a GrooveClip music sample automatically. Once your media is grooved, you can tweak it to your liking. Choose a different GrooveClip to sync to or something from your own music library. GrooveVideo will re-groove the video to the new music selection. You can change the size of the output between horizontal, square and vertical playbacks as well as change the length of time the video will run. If you want to really get technical, you can even see the grooved video broken down into frames of the media chosen and then change those frames to fit the final output you are looking for. Once you are happy with the final outcome, share with all of your friends via Instagram, Facebook, Messenger, WhatsApp, Kakao and even text message. One thing I would like to mention is I did have an issue getting the app to pick from my music for my videos, hopefully this is something that will be fixed because it was a feature I really wanted to use, though I did enjoy the GrooveClips that were included. I also think it would be a good idea for the video to be able to be edited in landscape for easier viewing, but this may just be my preference. GrooveVideo is a great tool for creating short, fun video collages of trips and memorable events. 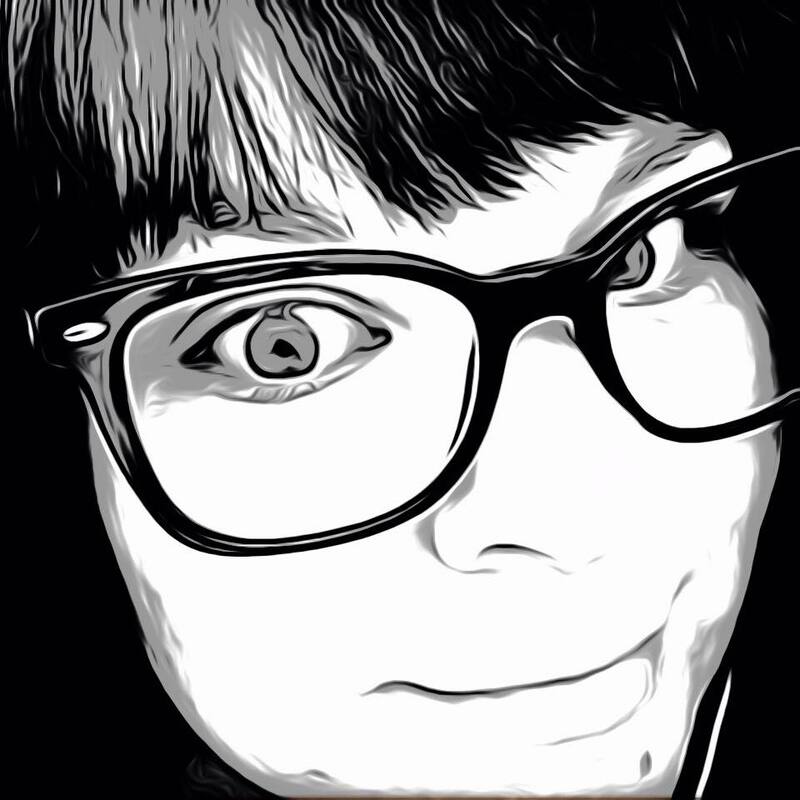 It is a super easy video editor that does all of the hard work for you and every creation is different and unique. 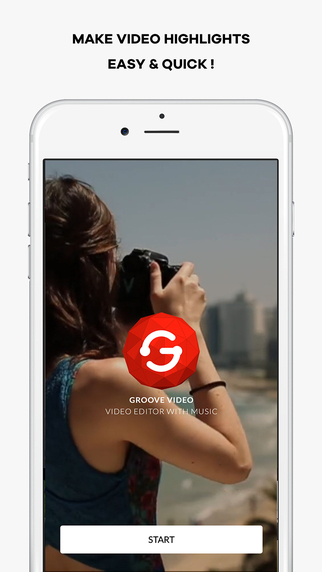 GrooveVideo is available now in the App Store for free and is compatible with iPhone, iPad and iPod Touch. Great app to go with my trip. Super easy to use and super fast to get my very first video. Like the idea that I don’t need to have wifi connection unless I share a video. It means I can edit my video at any where. I used to use Magisto to create a short video but it requires uploading my videos and photos upto Magisto clouding server. Hope that you would watch a short promotional video as well. My very first IOS app hope that you guys like to use it and leave comments.